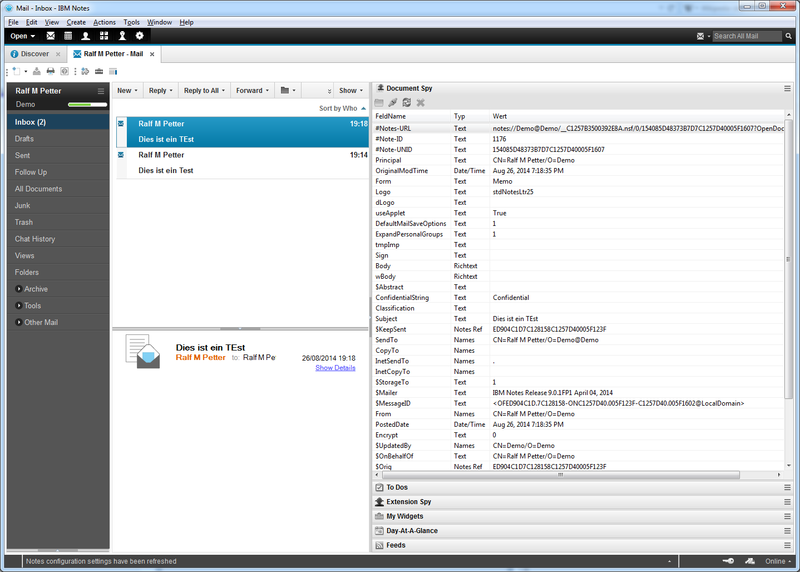 The Document Spy widget allows you to view the items of the selected document or profile document in the sidebar. If you like the "Document Spy" you can support my work with a small donation. Thank you in advance. You can find detailed informations how to use the Document spy on my blog. Open your My Widgets Sidebar view. Drag the link "Document Spy" to the "My Widgets" sidebar. If you have problems with the installation of the widget you can try to download the Updatesite as a ZIP archive. Allow Notes to install this unsigned plugin. After a short time Notes will ask you to restart the client and afterwards the new widget is available in your Sidebar. Due to security settings at my workplace I cannot access this via Googledrive. Any other way I can get hold of it? You can email (ralf.petterATgmail.com) me and i will send you the updatesite in an e-mail. You should note that this is actually a plugin distributed by a widget. 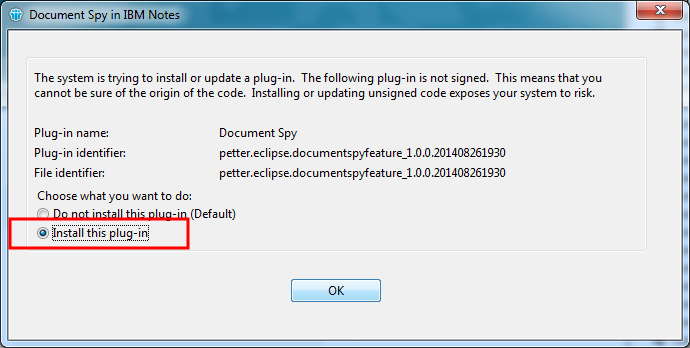 Most companies do not allow plugins to be installed by users, and some not even widgets. The installation instructions says „Allow Notes to install the plugin“. So i am not sure what you mean with your comment. The target audience for this widget are admins and developers and not users. Do you have an idea if there is a similar "Database Spy" somewhere available? Could be useful to create a search box to look inside item values. Do you mean a filter which filters the table in the document spy, so that the document spy shows only items with names or value matching the filter criteria. I find this an interesting feature and it should not really hard to do, because the table widget from the document spy is already enabled to filter the table by regular expressions, but unfortunately there is no UI for this functionality.